The Project Pyramid teams in Guatemala had the opportunity work in three different locations with three partner organizations: Bitmec, Rayos Contra Cancer, and Wuqu’ Kawoq. Read more to see reflections from each team about their experiences! As a student, I’m drawn to courses that incorporate real-world experience into the classroom. Along with three MBAs, my group had a Nursing and an International Education Policy and Management student. Working with an interdisciplinary team provides diverse expertise and reflects a realistic environment in which we must collaborate with people who have different perspectives and backgrounds. Together we focus on growing a social enterprise- an organization with a socially driven mission and sustainable, profit driven, and scalable financial structure. Bitmec Health Technologies Limited (“Bitmec”) is a technology startup providing healthcare services to underserved communities in Guatemala. Over Spring Break, our team traveled to four different cities: Antigua, Xela, Coatepeque and Guatemala City. We met with the founder of Bitmec, as well as prospective business partners for the organization, including a Center for Social Innovation and Entrepreneurship. We enjoyed learning more about cultural differences, including the way business is conducted, and gained a better understanding of the healthcare challenges in Guatemala. As Bitmec determines where the greatest opportunity is for their services, and how to structure their business model for long-term success, our team will be providing supporting research and strategic recommendations on their upcoming pilot launch. This course allowed us to put our business skills to use for a cause that can truly make a difference in these communities, and provided us with the trip of a lifetime to Guatemala. The Rayos Contra Cancer Team’s (RCC) International immersion trip was incredible! We are incredibly grateful for having an amazing team of people and for the partnerships we’ve made in Guatemala. Our, RCC team conducted multiple key leader engagements with various presidents, directors, and renowned doctors within the public and private health systems supporting radiation oncology and cancer treatment. 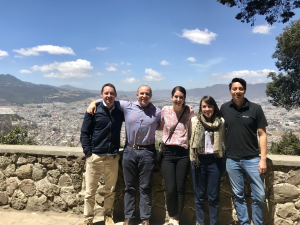 The goal of our team during our international immersion was to conduct research that will help us develop an economic assessment of 3D vs. 2D external beam radiotherapy along with cost benefits specifically focused on the public health system in Guatemala. We hope this analysis can provide greater energy and support towards RCC’s visionary efforts to make this transition to a sustainable, available, affordable, and high-quality service for emerging countries worldwide. The RCC team was comprised of students from multiple disciplines (business, public health, medicine, nursing, education). 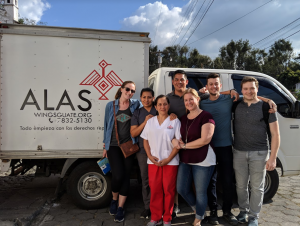 MBA students, two nursing students, and an med/MPH student, traveled to Guatemala over spring break to work with Wuqu’ Kawoq. Wuqu’ Kawoq is a non-profit organization that provides free healthcare services to rural and indigenous communities in Guatemala. As access to healthcare/ medication is difficult for people living in rural communities, Wuqu’ Kawoq bridges this gap by traveling to these communities and by communicating with people in their indigenous languages. We started our journey at Pomona Impact Hub in Antigua where we learned about impact investing and heard from exciting new businesses who had received funding from the Impact Hub. Following the kick-off meeting, my team spent time in Antigua and Tecpán (2 hours from Antigua). 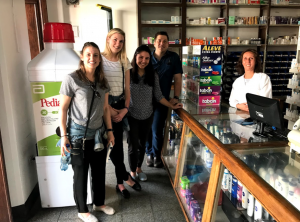 With our partner, we interviewed 10 pharmacies in Antigua and Tecpán and learned a lot about the pharmaceutical industry and competitive landscape in Guatemala! We also had the opportunity to see our organization at work and shadowed a nutritional visit in a rural community outside of Tecpán, which was a great learning experience and we gained a better understanding of value our partner provides in Guatemala and how much these services are needed there. At the end of the week, our team presented our findings to our partner and discussed our action plan for completing our work with them. Outside of our work with our partner, we spent a day hiking Pacaya (a nearby volcano), playing cards, and exploring Antigua! One of the coolest things about Project Pyramid was working with people from other graduate programs at Vanderbilt on a real consulting project. Due to our backgrounds and areas of focus, we all took the lead on some part of the project.